Despite a City Department of Investigation probe that found she lied about her voting address, an embattled Brooklyn Board of Elections honcho will keep her job, the Daily News has learned. 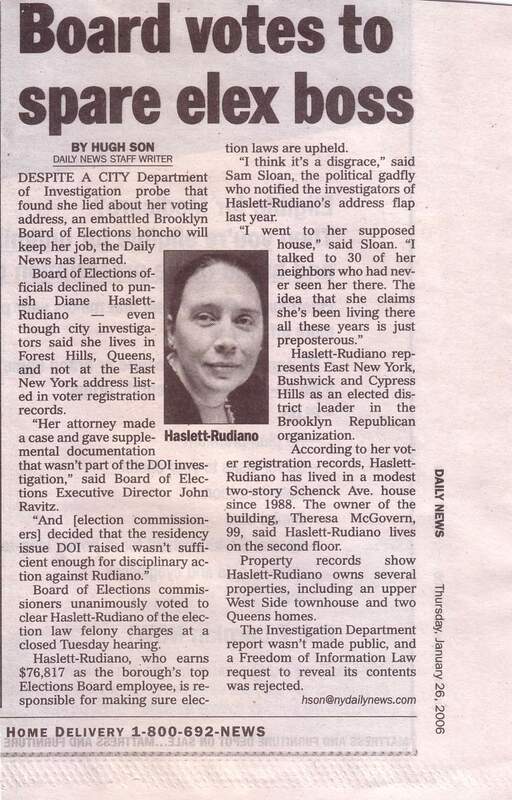 Board of Elections officials declined to punish Diane Haslett Rudiano - even though city investigators said she lives in Forest Hills, Queens, and not at the East New York address listed in voter registration records. "Her attorney made a case and gave supplemental documentation that wasn't part of the DOI investigation," said Board of Elections Executive Director John Ravitz. "And [election commissioners] decided that the residency issue DOI raised wasn't sufficient enough for disciplinary action against Rudiano." Board of Elections commissioners unanimously voted to clear Haslett-Rudiano of the election law felony charges at a closed Tuesday hearing. Haslett-Rudiano, who earns $76,817 as the borough's top Elections Board employee, is responsible for making sure election laws are upheld. "I think it's a disgrace," said Sam Sloan, the political gadfly who notified the investigators of Haslett-Rudiano's address flap last year. "I went to her supposed house," said Sloan. "I talked to 30 of her neighbors who had never seen her there. The idea that she claims she's been living there all these years is just preposterous." Haslett-Rudiano represents East New York, Bushwick and Cypress Hills as an elected district leader in the Brooklyn Republican organization. According to her voter registration records, Haslett-Rudiano has lived in a modest two-story Schenck Ave. house since 1988. The owner of the building, Theresa McGovern, 99, said Haslett-Rudiano lives on the second floor. Property records show Haslett-Rudiano owns several properties, including an upper West Side townhouse and two Queens homes. The Investigation Department report wasn't made public, and a Freedom of Information Law request to reveal its contents was rejected. UPDATE: My petition in Sloan vs. Rudiano has been accepted for filing in the United States Supreme Court. Here is what I hope to achieve from my petition.